We just couldn’t do a “Coolest Gifts for Christmas” without including the iPod Nano. Easily the most desired toy for kids and adults alike for the past year. Plus with the new design, better battery life and color choices how could we not include it. Our choice for the coolest Nano is the special edition red nano. Not only will you be buying someone the #1 digital music player but Apple also donates $10 from each sale of the Red iPod nano to the Global Aids Fund. The red nano also comes in 4GB and 8GB capacities so you’ve got options and lots of disk space to work with. Is the iPod nano on someone that you know’s wish list this holiday season? If extreme portability is not your biggest concern then anyone looking for a nice headphone splitter and amplifier should head over to the Boostaroo website. Even though the Revolution is nearly as big as the iPod Nano (if not bigger) it makes up for its size with functionality. Not only does it allow two people to enjoy the sound coming from an MP3, DVD or CD player (or anything with a standard headphone jack) but each listener has the option of cranking the volume up some 400%. So in 30 years when you head off to the otolaryngologist for a hearing aid you’ll at least have someone to go with. I also want to note that the Revolution requires 2 AAAA battery cells which only provide about 22 hours of battery life which could be a problem for some. The Boostaroo Revolution is available on their website for $49.99 and at the moment also comes with two sets of volume control headphones. Add a little artistic flare to any room with the Leaf Light designed by Yves Bhar for Herman Miller. This remarkable design not only allows you to control the light intensity but also lets you choose from warm light or cool light. Never worry about this Leaf Light over heating; it is designed to be cool to the touch. Very cool and a great unique gift idea for someone looking to modernize their office space. So I’m going to start off by telling you what the MyVu is not. It is not a television replacement, hell it’s not even a laptop replacement for watching videos. 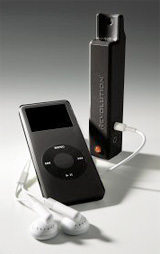 But beyond that the MyVu does have some great niche uses, if you’re comfortable with wearing a pair of goggles that beam images directly into your brain, now you can immerse yourself in the iPod video experience as well with MicroOptical’s myvu personal media viewer. The thin “stylish” myvu glasses include built-in 320X240 pixel LCD screens which give you the equivalent viewing size of a 27-inch television viewed from 6 feet away. Today we start our hunt for the coolest gift of the season with Sony’s Cybershot DSC-T50. Although maybe not the most unique gift in the world, this is a sweet camera. Measuring just 3 3/4″ x 2 1/4″ and less than an inch thick, you can bring the camera with you anywhere. It’ll even fit in a shirt pocket. So its super small, what else? Even though the Cybershot T50 is small it still manages 3x optical zoom and is 7.2 megapixel. The 3″ LCD screen makes it easy to check you pics right after taking them and to top it off the styling of the camera is just sweet. With the major influx of silver cameras on the market, a sleek, super cool black camera is a nice change. Thankfully hard drives and solid-state memory are rapidly taking over and they’re not only far more reliable but also offer vast more storage space. 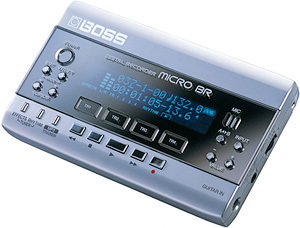 Case in point this Micro BR portable recorder from BOSS. It’s just slightly larger than an iPod and offers 4 simultaneous playback tracks with 2 simultaneous record tracks literally giving you a studio in the palm of your hand. And each of the 4 main playback tracks also has 8 companion virtual-tracks giving you 32 usable tracks in total. The Micro BR also includes a tuner, a drum machine with almost 300 samples, various on-board audio effects and of course MP3 playback.